How to create a procedural brick texture for a simple building without object size changing the texture size? I want to create some procedural textures that I can quickly reuse to texture objects. 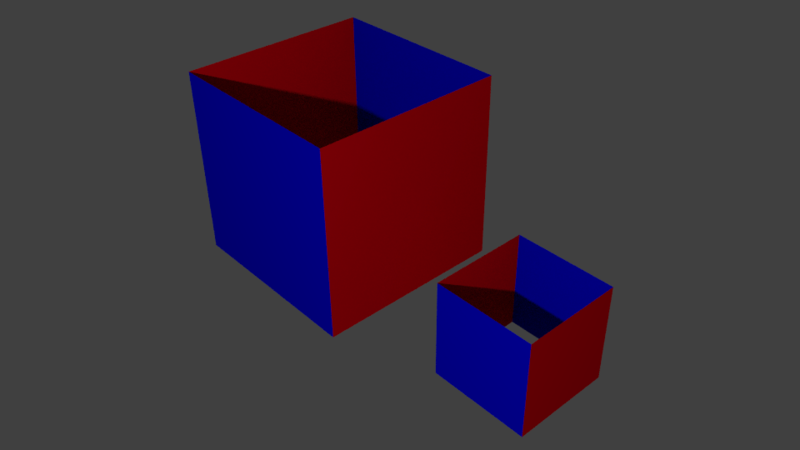 For this example I want four sided cubes (ignore top and bottom) that are wrapped in bricks. But, I want the bricks across different objects to be the same size, even if the objects are different sizes. You will notice in the image above that the "large building" is twice the size of the "small" building and the large building's bricks are also twice the size. 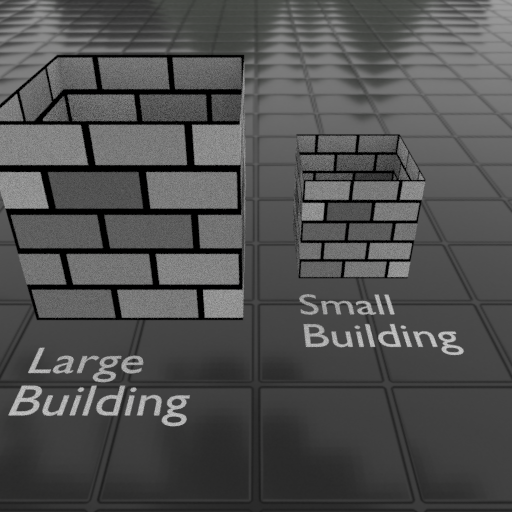 I believe this is because the procedural texture in "UV mode" is based on the bounding size of the object, so the brick size does not change regardless of if the scale is normalized. If I use the object node option, but that will not wrap the bricks around the cube. 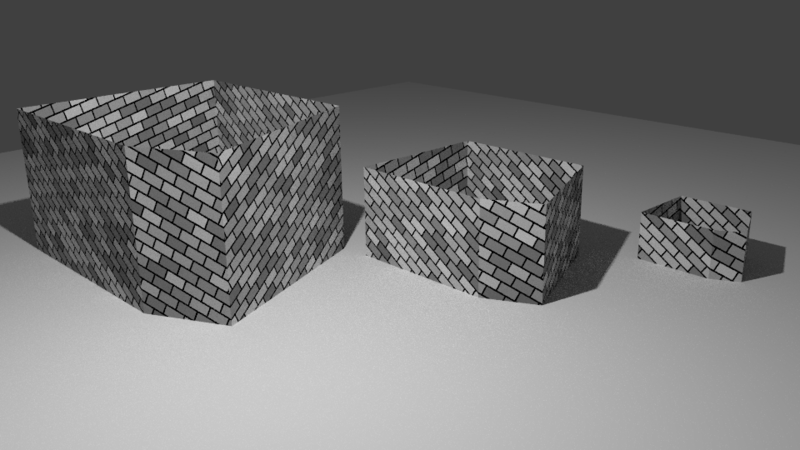 The only way I know to wrap the bricks is to use the Texture Coordinate node and UV as an input. Here is my material setup. I think the key would be to use some math so the input value nodes to the brick height and width nodes are based on the object bounding box size, but I don't know how to get this as an input to modify my brick size. 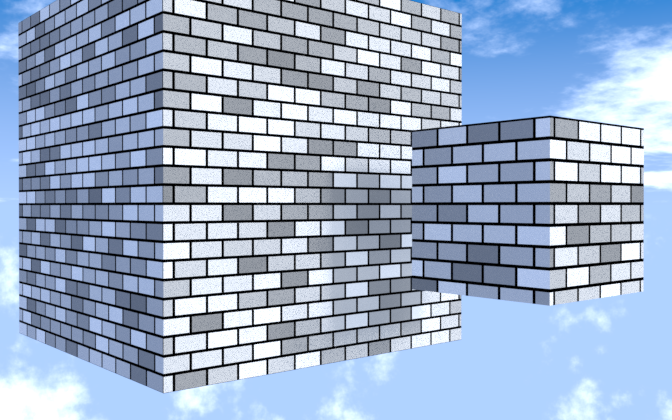 I also tried using a different object for the "object node" in the Texture Coordinate node, but the bricks did not wrap. Thanks. When I read Rich Sedman's first answer, I realized that what he does with the two materials can be solved with a single material using a trick called triplanar mapping. What is the problem here? 3D procedural textures can be made size-independent using Object coordinates, but the brick texture is only a 2D procedural texture, so it does not wrap around the mesh. The following is a simplified version of the blendswap material, because in this case we only need two projections (X and Y - this is strictly speaking biplanar mapping), and I also took out the mapping nodes because the scaling can be tuned in the brick texture. Note however, that the mapping nodes could be useful to reduce the discontinuity at the edges, as in Rich's answer. One drawback of the previous two answers (both my own and lbalazscs's) is that the faces are assumed to be parallel with the X or Y axis - neither solution copes well with surfaces that are not square with the axes. This can be addressed by using vector maths to determine the texture coordinates based on the surface Normal and a reference vector. The reference vector (Orientation) determines in which plane the wrapping will take place (in our case, around the outside of the building) and this can be adjusted if necessary (eg, if the brickwork needs to be skewed). The Orientation vector is defined in a Combine XYZ node (named Orientation). This allow it to be easily amended if required. This vector is passed to a Cross Product node along with the Normal of the surface. The Cross Product generates a vector which is at 90 degrees to both of the input vectors. Since one of those vectors is the Normal of the surface, this means that the resultant vector is directly along the surface. Since the Orientation node is vertical (0,0,1), this generated surface vector must therefore be horizontal. Both the generated Horizontal and the (vertical) Orientation vector are passed through Normalize vector nodes to ensure they have a magnitude of '1'. To generate the Texture Coordinate at the sample point on the surface, we use the Dot Product to combine the Object coordinate with each of the surface vectors (Horizontal and Vertical). The result of this will each be a scalar value representing the component of the coordinate in the direction of the Horizontal or Vertical vector and these are used as the X and Y texture coordinates by combining into a vector. UV mapping is unsuitable for this as the scale is dependent on the size of the faces. There is no simple way (that I'm aware of) of determining the size of the actual face within the material to scale the texture appropriately. The solution is to use Object coordinates - these are centered on the object origin but are the same scale for all objects - regardless of its size (provided the Scale has been applied). However (as has been pointed out) Object coordinates do not allow the texture to be wrapped around your mesh. The solution to this is to use different materials for each orientation of faces. This way, the faces that are pointing along the X-axis can have a texture that is aligned with those faces, while those aligned along the Y-axis can have a texture that is aligned with those faces. In my example I have two materials - one for the front and back faces and another for the side faces. If your mesh has faces at other angles then you should assign additional materials to those (eg, all faces at 45 degrees would be assigned a third material, those at, say, 30 degrees another, etc.). Each material should then be set up identically but with a Mapping node set to orientate the texture as appropriate for that set of faces. For example, for those at the sides, the texture should be rotated 90 degrees around the X axis as shown. 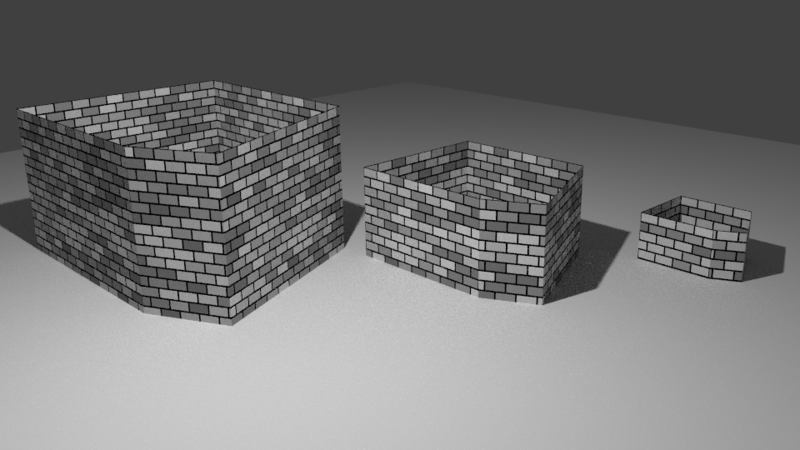 The bricks are now scaled the same, regardless of the size of the mesh/faces. You may get discontinuity of the texture at the corners (see the edge of the smaller cube) as it changes between the different materials. You can adjust the Location Mapping values for each material (and potentially add further materials to allow some faces to be adjusted without affecting others at the same orientation) to offset the texture to reduce the discontinuity to acceptable levels. You can get the ratio of the scaling between an object and another in cycles node editor by following the process described in this answer. If you choose an unitary empty as object for comparison, you'll get a ratio that is equal to the size. We can now use this colour (think it as a "value"), to scale the UV map of the object with the help of a MixRGB node set to Multiply. 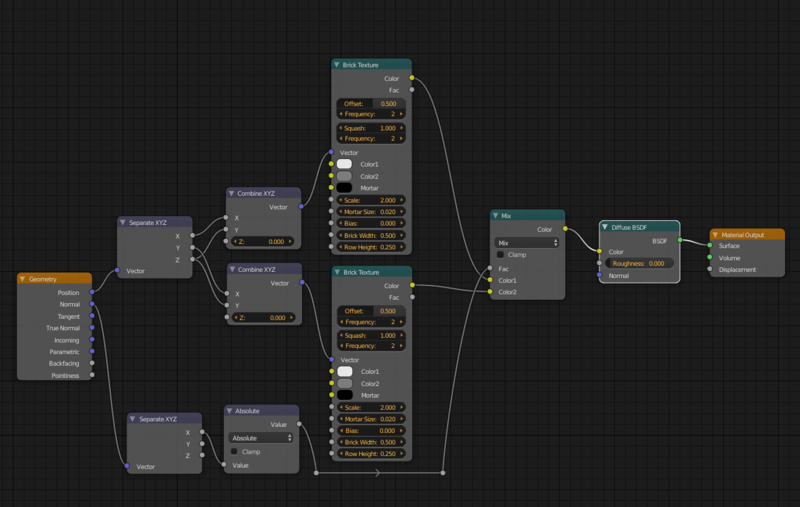 How would I change a Cycles material's color using the scale of the object instance it's applied to? Can I get the object dimensions in Cycles? 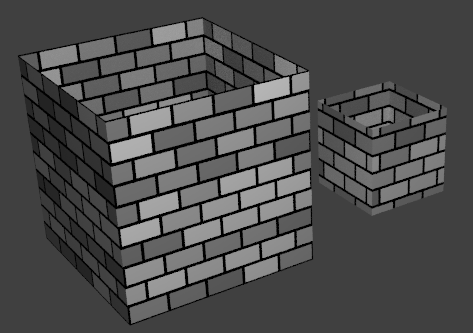 How can I make my procedural brick texture map correctly to both a cube and cylinder? How to smooth or blur a procedural texture?